Maria Khan attended the Academy Year at ECLA in 2010-11, as well as the ISU on Prussia this past summer. While at ECLA she was a regular contributor to the news section. Currently Maria is back in Pakistan, working as a production manager and a dancer in the staging of The Taming of the Shrew, which will be shown at Shakespeare’s Globe Theatre in May 2012. Susannah Harris Wilson finished her graduate studies in Drama at Stanford University in the summer of 1960. After finishing her degree, when Susannah began looking for a job, someone shared with her a listing for an opportunity in Pakistan. The principal of a liberal arts college, Kinnaird College for Women, Lahore, was looking for a person to help with the schools’ theatre department. Susannah took the big leap and in the autumn of 1960 she travelled to Lahore, Pakistan. What was to be a four-month tour became the most memorable four years of Susannah’s life. Lahore was a city rich in arts and culture and Susannah enjoyed and greatly supported the theatre, arts and music scene of the city. She made many different friends; “[a] second family and home,” she still claims. Her production of Amadeus there is still widely remembered. There were two things that inspired her greatly about Pakistan: the women and the Pakistani sense of humor. Susannah often says that she admired the strength of Pakistani women and that she was always taken by their wit and the ability of Pakistanis in general to laugh at themselves — even when going through the worst of times politically and socially. 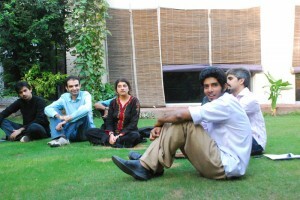 In 2007 when I was a sophomore at Kinnaird College, I met her for the first time. I worked with Susannah on Shakespearian Rags, a performance which consisted of seven different scenes from seven different Shakespearian plays performed in seven different settings. Susannah and I have remained in touch since that time. In February 2011 when I was at ECLA, Susannah called me from Oxford, where she lives now. She told me very briefly about Shakespeare’s Globe Theatre’s festival Globe to Globe 2012. The Globe Theater had invited countries from all over the world to perform Shakespeare in their own language while staying true to the text and meaning of the play. She had taken up this project for Pakistan and had asked a senior Pakistani TV/Stage Director to direct the play. She herself remained the producer; managing finances and other logistics of the play. She asked me if I would like to join the production after my Academy Year was over. At that time, I was walking around with an admissions offer from a graduate school in the UK, but with no money to fund the education. I kept hoping to start graduate school by October, but fate had something else written for me: I found no money for my graduate school and returned to Pakistan in a state of uncertainty. Susannah called me and emailed me. She encouraged me to start appearing at the rehearsals which had already started in April. Amongst a cast of 12 members, I was to play a dancer and also be the Production Manager for the play. Gradually the play became an important part of my life. Susannah urged the translators to not portray the protagonist, Katharina, as beaten and miserable; rather she should be a figure who finds strength in her womanhood. As a Pakistani woman, the play constantly prompts me to learn and unlearn my very own tailor-made concept of male-female relationships. Katharina (Kiran in Urdu) from The Taming of the Shrew faces the same conflicts that a contemporary educated Pakistani woman goes through. At the end of the play she arrays herself like a shy traditional bride yet is portrayed as having formed a considered judgment of the partner with whom she will spend her life, and of the situation she finds herself in. Our production of the play is full of Persian and Urdu classical music and dance and depicts Lahore as the cultural equivalent of Padua, a center of education and learning. The play has educational value, as it places great emphasis on the arts as a medium of education and also conveys that the arts can spiritually and emotionally purify a human being, while at they also sharpen the mind and thinking process. This experience has led me to rethink my educational plans. I have decided not to apply to graduate school to study what I had intended to before, philosophy and public policy. Instead, my involvement with this project, combined with my full-time job at a teacher’s training institute, has urged me to look into the field of Arts Education. I now plan to study Arts Education, focusing on how using folk arts as a pedagogical tool can enhance creative and critical thinking in the educational system in Pakistan. Working on this production of The Taming of the Shrew allowed me to meet new friends and also participate in an exciting travel experience. The play will be staged at Shakespeare’s Globe Theatre in May 2012, followed by performances at Said Business School and Oxford University.